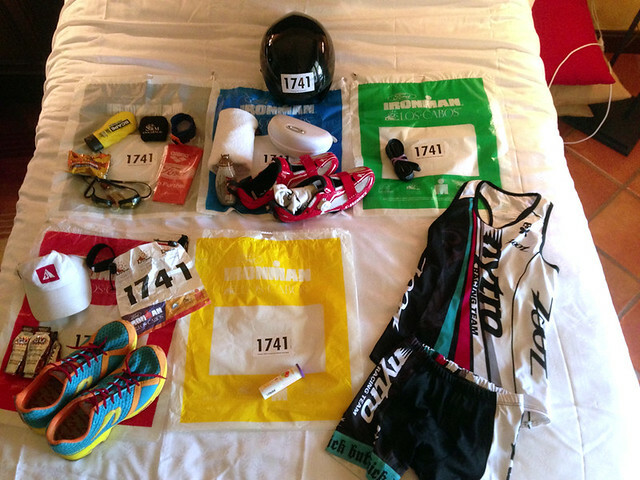 My first Ironman race report practically wrote itself. I’m not sure why, but this has been a tougher labor, written in fits (of illness) and starts (of mental battles). One thing I do know, if I don’t write it before Sunday, the two-week anniversary of my second Ironman finish, it’s not going to happen. 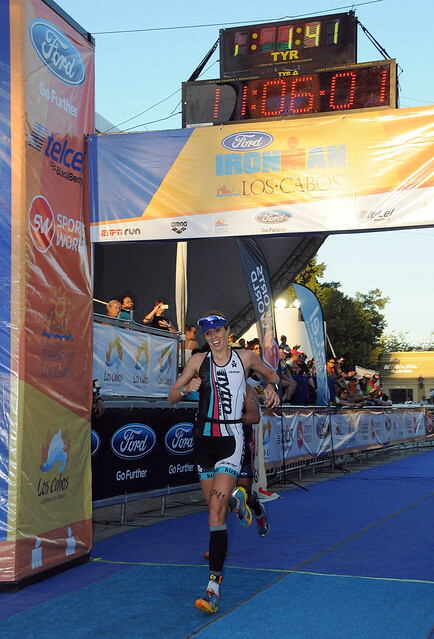 So, for those of you who’ve been asking for the whole enchilada, here is my “official” Ironman Los Cabos race report. Having already mastered the minutiae of one, I was much more relaxed about this Ironman. Once again, I shipped my bike a week prior with the unsurpassable Tri Bike Transport. Once again, I followed my race nutrition plan from QT2 Systems. 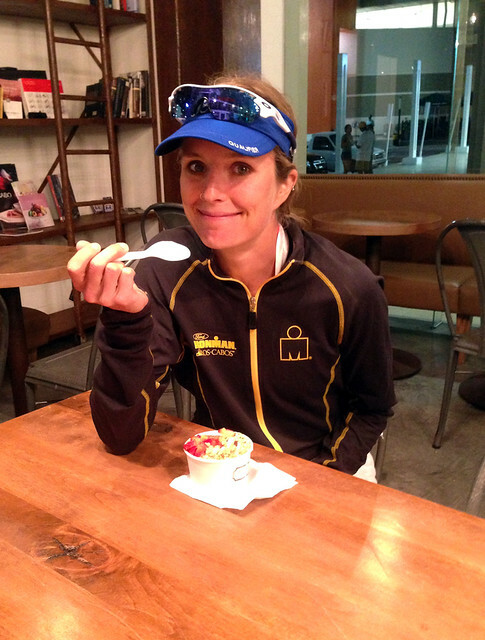 For my pre-race carb-loading, however, I didn’t stuff myself silly, and chose to eat a bit more in line with how I normally do. After my best pre-race sleep ever, my alarm went off at 3:45 a.m. My nutrition plan dictates 2.5 cups of unsweetened applesauce (low fiber, high glycemic index), which I should’ve brought with me. All I could find at the local Mega was the sweetened kind, which was so sweet I could only get about 3/4 of a cup down. I sipped on coffee and a Vega All-in One Chocolate protein shake, and ate a banana. Having dropped off most of my gear the day before, all I had to do was suit up in my new, comfy Nytro Women’s Team kit (by Zoot), and grab my swim stuff gear, water bottles, helmet, and the necessary Ironman bags. By 4:50 we were seated in the hotel race shuttle, ready to go. At the race site, it was business as usual: A pump of the tires, attaching of water bottles, helmet, and sunglasses to the bike, and the routine porta-potty stop. Then and I was free to wander around and visit with Mitch, Courtney, Beth, Amy, Julie, Steph, and others. (It’s always more fun with friends!) I lubed up with anti-chafing Skin Sake, covered my skin with Scape sunscreen, and ate a Peanut Butter Power Bar (the old-school kind). The early-morning jazz music was a better choice on the part of the race directors than the usual Ironman soundtrack. Kudos to them for the moment of zen. As the sun rose over the ocean, a pink glow covered the transition area. There was ample time to get everything done, and not a stitch of that rushed feeling. It was warm and comfortable, yet in the back of all our minds we knew a certain form of chaos was imminent. I pulled on my Nineteen wetsuit, race cap, and blueseventy googles. (Both had treated me well in Mont-Tremblant, and I hadn’t had the chance to try my new team Zoot Prophet yet.) I jumped in the 70-degree surf to allow my body to get over the initial shock of being in a new element, ate a GU Chocolate-Raspberry Roctane gel for another blast of caffeine and carbs, and joined the long line of athletes waiting for their Ironman baptism. I ran into teammates Julie and Amy, and got my first glimpse of Rob and Barbara (who had flown down just to watch me race), grateful for the positive boosts. I stationed myself at the edge of the pack this time, rather than front and center as I did in Canada. The air horn went off, and I joined a thousand or so others in allowing the sea to swallow us up. I started my Garmin and headed for the first buoy. Right away I noticed the smaller field: I got kicked way fewer times, and despite my goggles getting knocked off, it was a pretty low-drama swim. No mini panic attack this time around! The whole thing felt a lot more comfortable. I was grateful my swim coach had encouraged me to learn one-sided breathing, as the bright sun pretty much prevented any attempts at bilateral breathing. Though much slower than I’d expected (1:16 versus my best-case scenario of 1:08), the swim went well. I hadn’t set hugely ambitious goals for the swim; despite significant speed gains in the pool, the ocean is a different world. My sighting was horrible: I actually stopped swimming at one point and reprimanded myself out loud in the middle of the ocean. On the way back to shore from the last turn-around buoy, a strong current made the water feel like molasses. I was happy to learn later that others had strangely slow swims as well. My Garmin recorded a 2.56 swim (rather than the proper 2.4), so I know that my 1:40 pace wasn’t indicative of my current abilities. So it goes. With the bike up next, I knew I could put some time into the women ahead of me, and into my own sub-11 goal. The bike: did somebody say elevation? Out of the water, I sprinted across the beach and up the stairs to where the bike gear bags waited. I had bought some red ribbons to adorn my bag so that I could find it easily among the mass of bags. When I dropped it off, however, a Triathlon Mexico official informed me they weren’t allowed. So, I borrowed covered my bag in black Sharpie X’s as a last-ditch attempt. I found it right away, and hit the change tent. 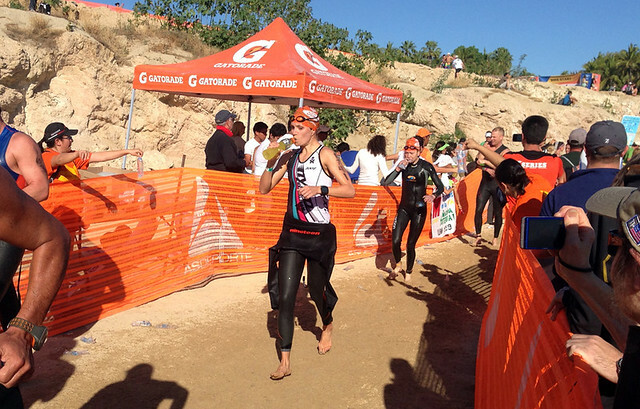 I stripped off my wetsuit with the help of a volunteer, and pulled on socks and my Specialized S-Works Trivents. My bike was on the edge of the corral, so I found it easily and pulled on my Giro Selector and Oakley Radar Locks. I was out T1 three minutes faster than I had been in Tremblant, due to the shorter “transition journey” (.3 miles versus .5). 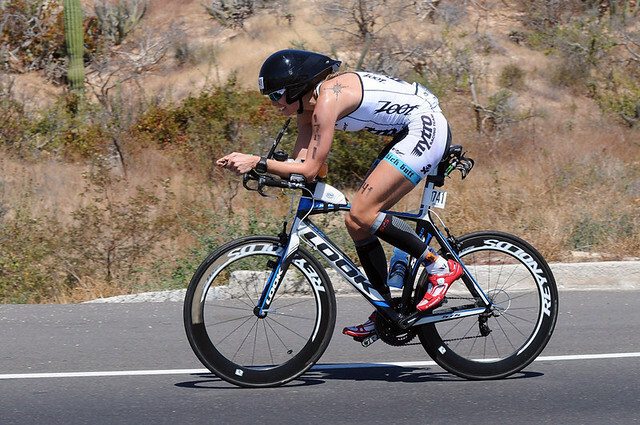 The feeling of getting on the bike in a triathlon never gets old for me. I hopped on, hoping my first long ride with my new, more minimally-padded shorts would go smoothly. (I’d just received my kit 10 days before the race and hadn’t had a chance to test out the thin tri shorts on a long ride.) I began peddling up the hill, passing a couple of the faster swimmers in my age group right away. Bye bye, sisters. Possibly my favorite shot of the day. Doing work. My five hours and 36-odd minutes in the saddle passed by more slowly than in Tremblant, thanks to high winds, mouth-parching heat, and a quieter course. There were times I felt very alone out there, a sole figure rolling along the Baja coast. Had I missed a turn? No, I was on course. Spectator crowds were markedly thinner, too. Given these factors, I was glad my physical bike strength was able to keep me going through times of physical and mental fatigue. Once again, I’d taped my nutrition plan to the top of my Speedfil A2 bottle, mounted between my aerobars, and set my Garmin to remind me to eat every 40 minutes. Once again, I went with a half Peanut Butter Powerbar for the first few installments of calories, chased with my concoction of grape EFS. 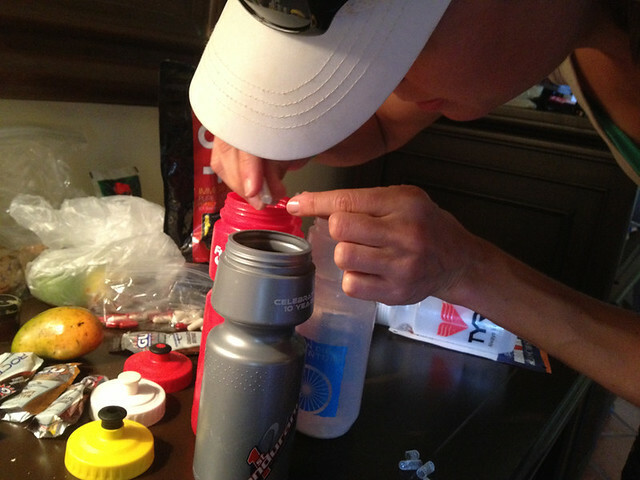 Beginning at two hours in, I switched from solid food to caffeinated gels, salt pills, and liquid. For this race, I decided to try course nutrition (in this case, Gatorade), rather than picking up three of my own bottles at the halfway point special needs station. Cold Gatorade and ice water was a godsend on a day that reached 90 degrees, and I was happy I’d made the decision. I flew by special needs, thankfully not needing the extra tube I’d stashed there. A Kona-Mocha flavored EFS Liquid Shot rounded out my five-hour long buffet, but this time around it proved too sweet for my palate. A closer look at my LOOK 576 (with SRAM component group) setup: 1 – XLAB Delta with Gorilla cage and C02 mount, 2 – Adamo Racing saddle, 3 – small tube bag with flat fixing supplies, taped to seat tube with electrical tape for added securtiy, 4 – Speedfil A2 aero bottle, 5 – XLAB Torpedo mount on Top Cap Cage Mount from King Cage, 6 – PRO Missile Craig Alexander Star Series aerobars, 7 – Reynolds Sixty Six’s, 8 – Continental Grand Prix 4000s’s, 9 – SRM power meter, 10 – LOOK KEO max carbon pedals, 11 – XLAB Chimp cage with Fuel Belt bottle. One thing reflects how hot this race was: Whereas I peed six or seven times on my cool Canadian Ironman, during this one I only peed twice, and not until the 60 mile mark. TMI maybe, but some of you people like that sort of detail. Even more than my new personal best overall time (11:06), my Cabos bike split (5:36:23) is what I’m most proud of. The course was leagues harder than anyone anticipated. (My Garmin reported 6,371 feet of elevation gain, others have reported higher numbers.) Whatever the details, it was hard. Sure, there were a few “gentle rollers,” but the 20-mile out-and-back airport toll road was a real leg-buster. Around mile 90 I started doing my usual half-assed calculations about what pace I’d have to average if I wanted to break my 5:38 Tremblant time. My best intentions were smacked down by lap number two of that awful road, and I found myself saying “Really?! We have to do this again?” It’s strange how facts we know—roads we’ve already been down—can still show up to surprise us. I stopped at almost every aid station to rip a water baggie open with my teeth and squeeze it over my head, satisfying both my growing aggression at the run and my need to keep a cool head. Literally. After almost gagging on a usually-palatable Peanut Butter GU at mile 10, I trashed all my gels and resorted to an afternoon snack of salt pills, Advil, and Rolaids (all of which I’d stuffed in a little water-resistant Lululemon zip wallet, definitely a do-again). I sipped on de-fizzed Pepsi from the numerous aid stations, which was something new that seemed to help. At mile 13, I grabbed my trusty Ensure and stuffed it with course ice in a last-ditch attempt at comfort. It helped, but didn’t cure the pressure in my esophagus. But enough about that. There is no perfect race, and that was my particular cross to bear on March 17 in Baja. I’ll never know what exactly caused it. Heat? Gatorade? Eating sweetened applesauce instead of unsweetened? 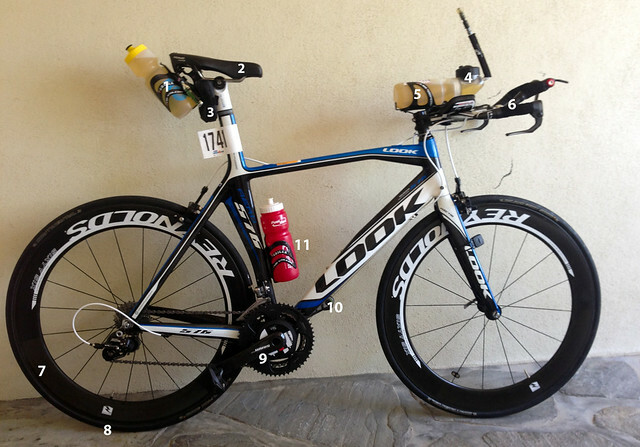 Ironman is part science, but sometimes I feel stuck in the experimental-hypothesizing stage. As a friend and coach remarked on the beach the next day, the problem with nutrition is that what works one day might not the next. You can only plan for so much—the rest is defined by your response to it. My response to the run may not have been ideal, but I worked with what I had. I chose to channel discomfort into the emotion that seemed to best serve me at the time—anger. It’s not always the best choice, but on that day, anger helped propelled me to the finish chute. Anger at the pain for stealing my thunder. Anger at the fact that I’d trained so hard, but was going to have a slower run. But anger somehow fueled the fight instinct in the rest of me—the muscles, heart, and lungs that seemed to be doing their thing just fine. Maybe by anger I really mean something more like grit. Or perseverance. Or one of a thousand other words. I collapsed into Mark’s arms at the finish line, and when he tried to talk to me, I asked for a few seconds to myself. For some reason, I just needed a tiny moment of silence. I sat on a chair, breathed deeply, and that was it. We met up with Rob and Barbara, dropped off my bike, and stopped for fro-yo, which always feels good on my chest. Back at the hotel a bubble bath and pizza rounded out my Ironman day. No loud finish line this time, just the primal necessities of food, sleep, companionship. Sorry to the dude whose finisher shot I ruined. I didn’t break 11 hours. I didn’t qualify for Kona (not that I’d expected to anyway). But my second little 140.6-mile trek through the elements was fun, in it’s own weird little way. And that’s why I do this. My training had been more consistent and better quality, and I was stronger than ever come race day. And let’s face it, this particular Ironman’s Pandora’s box could’ve been a lot worse. And now, almost two weeks later, I’m finally starting to feel like I might want to do it all over again. Next year. What a beautifully written article, Jen! I felt like I was right there with you as I read about your race. And I sure hope to be next time! Congrats on a race well done, and an article well written!! Wow, Jen, incredible. I was in Los Cabos last year with Meghan, but all I did was walk the beach! You are an amazing machine; so impressive, and eloquent all at the same time. great piece. This was my first Ironman and for what it’s worth I also got badly sunburnt (especially the back of my hands). Attempting to acquire the ‘De Soto’ cool wings to avoid a future repeat scenario. Thanks Anna! Love to help out a rookie triathlete any way I can. Great race report. 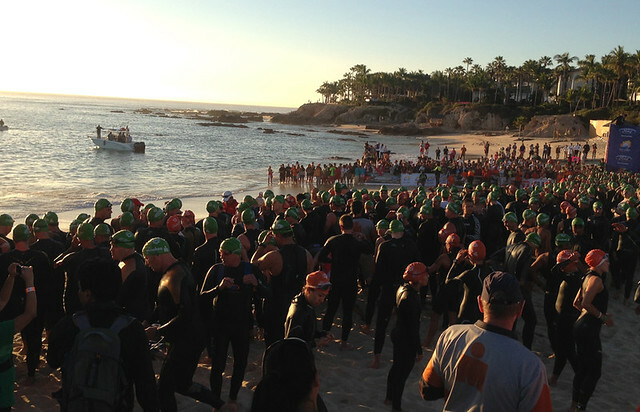 I am considering signing up for IM Los Cabos 2014 but since I am not a great swimmer my questions are always about the swim leg. What do you think about the swim? Clear water? Choppy, waves, etc? Any feedback would be appreciate it. Hi Alejandro! I swim in the open water often as I live in San Diego. Thus, the Cabos swim suited what I feel comfortable with. The water was the perfect temperature in Cabos, not too hot (wetsuit-legal) but comfortable. The water is deep and clean and clear. There are a few tiny little jellyfish that sting, but it just feels like tiny shocks (doesn’t hurt). I wouldn’t say there was chop on the water, more like gentle rollers that sometimes made it hard to see the buoys. But other than that, it was an ideal swim. A little slow (course was maybe a bit long), but a great venue. Thanks for the info, Jen. I live in the Northeast so ocean swims up here are not as nice as San Diego, I assume. Swimming in the middle of the ocean freaks me out, so I am still thinking about signing up for Cabos. Would you say there was plenty of safety people on the swim course? Kayaks, etc? I often hear that IM races outside of the US tend to be less organized in terms of safety. I felt very safe on the course in Cabos. There were plenty of safety boats, buoys, and ample opportunity to practice swim. The water is clear and clean, even of kelp! This is a great report and I’ve been thinking about doing this race. I’ve heard through the grapevine that the roads on the bike course is terrible. Are these rumors true? Hi Derek, I know they’ve changed the bike course a bit since I did it in the first year (2013). The roads aren’t great, but honestly, I didn’t find them “terrible.” I thought the Vineman 70.3 roads were just as bad, if not worse. There were a few of those “turtle shell” reflectors, but I’m 99% sure they covered many of them for race day. It’s a good race, and now that it’s in the fall will probably (?) be cooler. It’s a fun vacation town and a great race getaway. For what it’s worth, it is much, much HOTTER now that the race is in October.